There were a lot of recommendations and some strong opinions from quite a few folks. I’ll run through some of them here. Agency Analytics offers a robust, white-label friendly dashboard that’s a straight forward setup. The free trial is easy enough to sign up to, no credit card necessary, just an e-mail and you’re off to the races. Adding your campaign is quick, one reason is it gives a lot of your most important keywords to you automatically. They must be scraping an API for this, it was spot on. Even though this article is primarily about SEO dashboards, I think it’s worth mentioning that Agency Analytics also covers PPC, E-Mail, Analytics, Social, and Call Tracking… So for any SEOs that also offer ancillary services like paid marketing, it is convenient having this all in 1 dashboard. The GMB reporting from Agency Analytics is a lot more robust than the native Google dash. 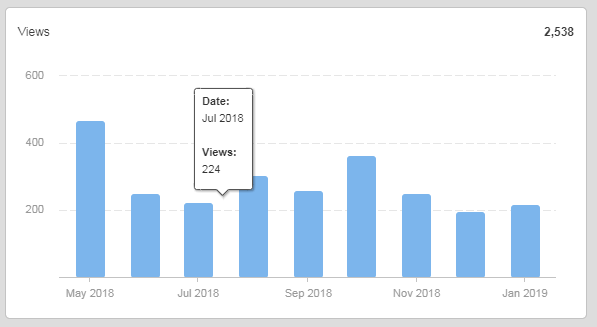 One thing the native GMB dashboard currently lacks is historical data that you can compare, so it’s difficult to tell clients that they’ve improved month over month unless you’re using something like Agency Analytics that will actually give you the %. The simplicity, ease of use, and nice aesthetic make Agency Analytics a top contender. If you’re looking for a solid, client facing SEO dashboard, this solution will probably be the baseline that you compare everything else to. Plans for AA start at $49/mo for 5 campaigns, which I believe would end up being about $10 per dashboard. Agency Analytics taps into historical GMB insights nicely, no matter when you put the location into the system you’ll get all the data you need. Here’s some GMB data for a new location added in 2019, over the course of 2018. At first glance, DashClicks feels like a re-skinned, lackluster version of Agency Analytics. However, DashClicks features a Listings Manger while Agency Analytics does not. On the DashClicks website it says “Control and manage all your directories from one place.” – I counted around 70 sites it supports, which is less than a 1/3rd of the citation ecosystem but they’re many of the big ones and this could be a nice feature. I don’t really see a way of putting in my own listing data or making good use of this feature, however. Maybe it works on sign-up? Who knows. Keeping track of local listings within DashClicks. I can’t help but wonder why listings are alphabetical, they should be sorted by strength/importance with GMB right at the beginning. Like Agency Analytics, DashClicks also features a white label option where clients can login and view their stats, you can learn more about their white label version here. GMB Insights inside Dashclicks give cumulative data and thus can be easily compared. I can’t find any prices for using their dashboard solution, I think this dashboard may exist secondary to their service sales, overall I’m not too impressed. 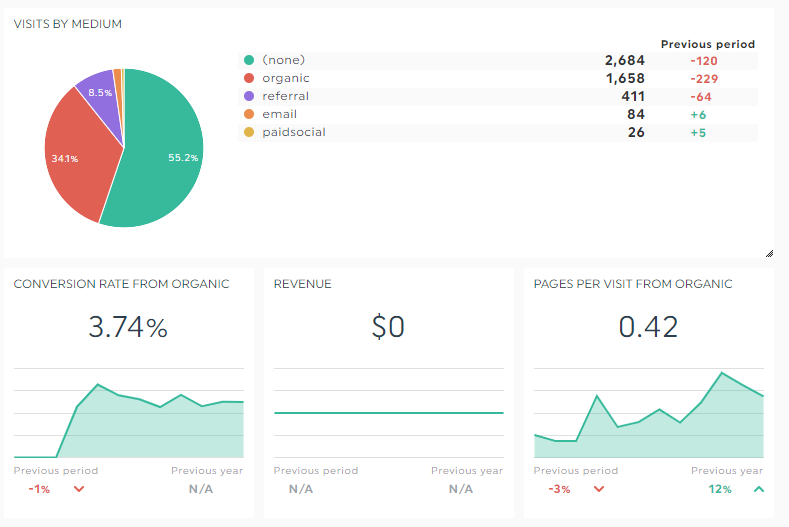 DashThis starts at $33 for 3 dashboards and touts a ton of useful integrations. Ahrefs, SEMrush, and Moz all in one place? Just a few of the integrations available within DashThis. The overall function of DashThis reminds me a lot of Cyfe. But it is definitely more oriented towards SEOs, with integrations like Ahrefs and SEMrush which aren’t found on Cyfe. DashThis touts a higher price than Cyfe for a similar experience, but I like the aesthetic. Since I have mostly local clients, the lack of GMB integration is a deal-killer for me, though. Surprisingly, they might have dropped the ball on the GMB integration, however…which Cyfe has. Without a GMB integration, I can’t see myself paying beyond the $10/dash Agency Analytics price for this. Even though Cyfe is missing some important integrations from the likes of Ahrefs, you can still hook it up to Moz (bleh).. But one place Cyfe shines exceptionally well is their GMB integration! 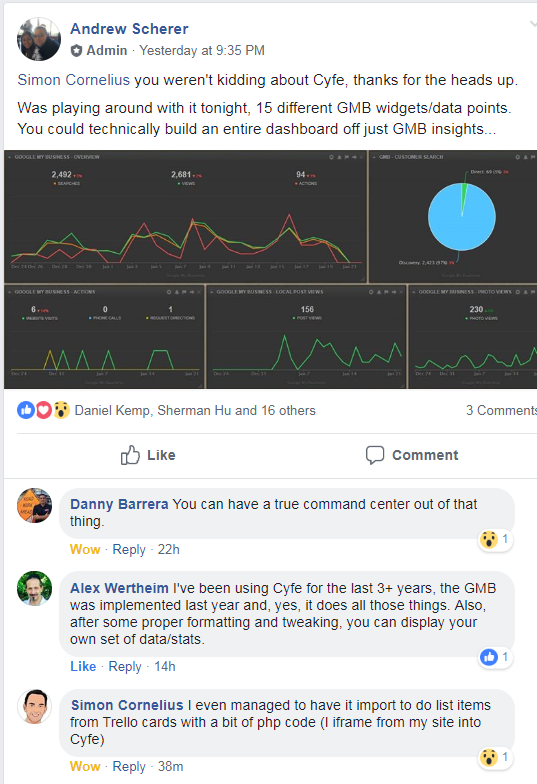 you can build out an entire dashboard just off of GMB data. And in the photo below, I actually did just that. The amount of data points Cyfe gives and the ease of manipulating them makes for a highly customizable SEO dashboard. Geckoboard is another one similar to Cyfe but Geckoboard has no real SEO integrations that I could use, no GMB integrations, and a Google Analytics integration in beta. With pricing at a bank busting $25 per dashboard, I just skipped them. One thing Cyfe really has going for it is their $29/mo pricing. You can build out unlimited dashboards which is a steal of a deal.. however if you want to white label, it’s $20 per client. If you’re looking to white label for clients, it might not make sense paying double the price compared to other SEO dashboards. 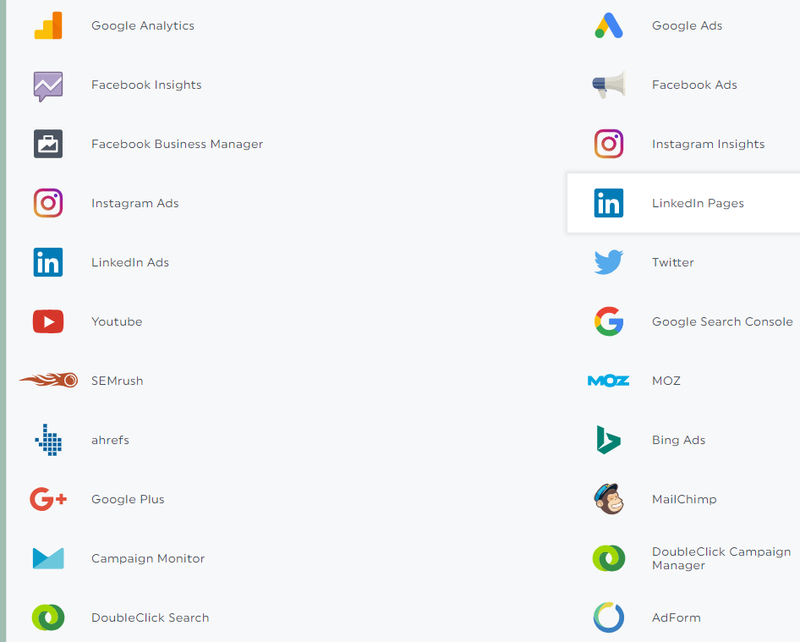 RankRanger offers integrations with GMB, Ahrefs, Yext, Google Analytics, Search Console, and more. Everything that you would need to make a pretty robust SEO dashboard with. A shot of GMB data within their internal dashboard you’ll have access to. While the internal dashboard looks cool, I couldn’t for the life of me get the client facing dashboard going. The interface is difficult to work with and from a UI perspective needs a lot of work, but perhaps the simplicity of Cyfe spoiled me a bit. Tried for 30 mins to get the client facing white label dashboard rolling, no dice. RankRanger, both a report builder and the promise of a white label dashboard deserves a second look via their free trial. At $69/mo for 10 campaigns, I am assuming it would end up around $6.90 per client dashboard (if you can get them to work). So price wise, that’s not too shabby at all. A promising option with some kinks to work out. A lot of what I was recommended wasn’t truly a “dashboard” solution, but more of a report building solution. I’m going to list some here. Although the homepage advertises the ability to build dashboards through this, it didn’t seem incredibly apparent to me when I tried it out. I hooked up a Google Analytics account and it had a stellar report builder, however, for those that like doing reports. 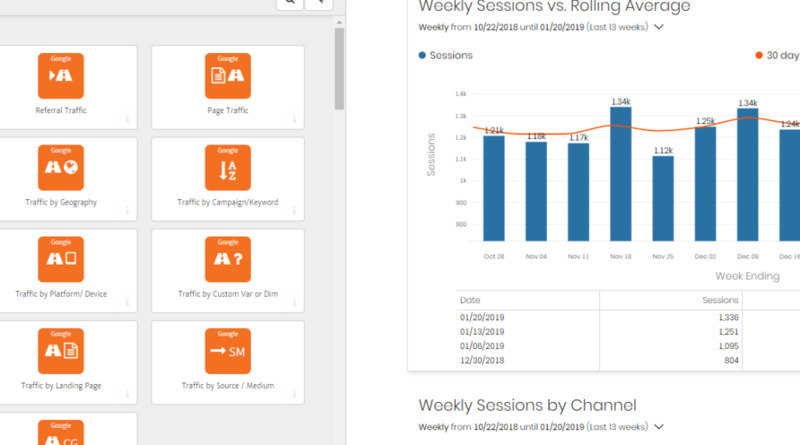 The Megalytic report builder connects with GA, Facebook, Web Console, and more. It’s quite robust… adding data is by widget, just a single click away. Starts at $75/mo for 20 clients, Swydo is advertised as a report building solution for online marketers. I haven’t gotten to try it just yet.